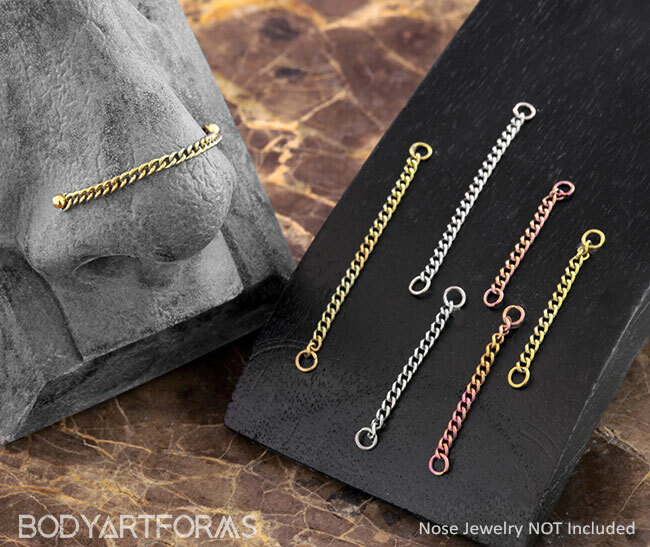 Get creative and add character with these basic nostril chains! Made by Zadamer Jewelry from implant grade titanium, they are anodized into assorted colors. These chains can be used for bilateral nostril piercings or upper cartilage piercings. The end hoops on the chain will fit either a 20g, 18g or 16g piece of nostril jewelry through them. The length given is the measurement from the center of one jump ring to the center of the other jump ring. With anodizing chains, the color is not going to be consistent through out the chain.